Photo Credit: David Harrison, Mail & Guardian. By now everyone is well aware of what happened in the National Assembly on the 12th of February 2015 when President Jacob Zuma delivered the 15th State of The Nation Address (SONA). The night was off to a rocky start once news broke of South African Police Services arresting five Democratic Alliance (DA) members outside parliament. Things continued to grow increasingly tense when parliamentary officials and journalists chanted “Bring Back the Signal” - in reference to the jamming device that been activated within the National Assembly thereby interrupting cellular signal. This act was seen as a gross attempt to suppress the views of those present and a violation of the media’s freedom of expression. The issue was raised and Speaker of the House Baleka Mbete gave, in my opinion, a very inadequate answer by stating, “We’ll look into it.” Not a “we’ll rectify it immediately” but rather “we’ll look into it”. I may be overanalysing her response, but to me, it came off as if she did not realise the implications of the signal being blocked. If there was ever an attempt to mute the voices of journalists and parliamentary members then this was definitely it. The DA has to be commended for bringing up the problem in a respectful manner, because it did need to be addressed immediately. Once the issue was rectified, President Zuma started his state of the nation speech but was rudely interrupted by an Economic Freedom Fighters (EFF) member Godrich Gardee. EFF member after EFF member then continued to bring up the matter of Nkandla asking when Zuma intended to pay back the estimated R246 million of taxpayers’ money that was used to upgrade his private rural home. EFF party leader, Julius Malema, memorably stated: “You are making a mistake because you are reading my mind” in reply to Mbete’s comment that Malema was not raising a new point of order. This was disappointing behaviour from the EFF, as it was previously stated within the National Assembly that the president would answer oral questions in parliament on the 11th of March 2015. No one is denying that the matter of Nkandla certainly needs to be addressed, but the manner in which it was raised was inappropriate. The National Assembly was informed in advance that the president would answer their questions on a specified date, but yet the EFF still chose to hijack the president’s speech. Once the party persisted with the subject and made it clear that they were not going to leave it, all chaos broke loose once Mbete called in security personnel to remove the EFF. This was an unprecedented action because never before have unmarked armed men rushed in to remove parliamentary members. Not only were many EFF members forcefully removed, but they also removed violently. 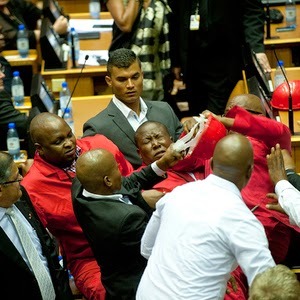 There are numerous pictures showing how battered some EFF members were and how torn their clothes were. There was nothing respectful in how parliamentary members were removed; it was brutal and degrading. DA parliamentary leader, Mmusi Maimane, subsequently enquired if the men who rushed in to remove the EFF were in fact police, and stated that the DA would leave if the question was not answered. The reason for this was because the action is a violation of National Assembly regulations. National Council of Provinces chairwoman, Thandi Modise, who was seated to the right of Mbete, explained that parliamentary protection services were used but that she was unable to distinguish which were police officers and who were not. The DA then decided to leave parliament. South Africa has been facing a lot of questions surrounding police brutality and if the security personnel were in fact policemen, which looks to be the case, then this was a prime example of how that issue sorely needs to be addressed. The EFF were wrong to bring up Nkandla but the manner in which they were removed was deplorable and reminiscent of a militia state. What is the purpose of having police officers if they are as responsible for the violence against South Africans as assault criminals? This entire course of events happened for an hour, causing a delay of the president’s speech. Throughout the entire time, President Zuma sat quietly watching on but never doing anything to help resolve the issue. Once he got up to speak, he chuckled in response to what happened before starting his speech. The fact that President Zuma laughed at the events of politicians being aggressively forced out and others conducting a walk out showed a lack of understanding the seriousness of the situation. He came across as detached from the events, and as a president you are meant to be informed of what is happening within National Assembly. Whatever happens in the National Assembly should be of important concern to him but he appeared as if he could not have cared less. In a snippet from an upcoming TV interview that was broadcast on SABC news, Zuma said that what happened on the 12th of February should have never happened; the rules and regulations of parliament are there for reason and that they should be enforced. It appeared to me that the president stated this as a way to save face for not being critical or appearing affected by the actions that occurred before his eyes. Former President Thabo Mbeki, who was embarrassingly recalled from his position in 2008, slammed President Zuma over the brawl in parliament. He stated that Zuma was wrong to avoid answering questions in parliament. Mbeki believes that Zuma should have directly answered the questions as it would have been the easiest way to deal with the issue and in retrospect I think most would agree with his point. Maybe there would have been no need for walkouts and violent forceful removals of politicians if President Zuma took a few minutes to answer questions before continuing with his speech? No one is denying that watching SONA looked comical from a viewer’s perspective but it was very revealing in how the president just sat back as if none of it concerned him. While the events were completely disheartening and appalling, it needed to happen. The EFF chose the wrong time to bring up Nkandla but it showed how fed up they were, like many South Africans, regarding the situation. Zuma had been playing coy and strategically avoiding answering questions regarding Nkandla for months prior. Oftentimes as South Africans we are accused of being too complacent and easy to accept the appalling behaviour of our politicians without doing anything. We basically do the Zuma laugh like he did at the start of his speech; continuing on as if nothing is wrong. There was story last year when the Free State provincial government spent R40 million on a website that cost $40. Now I’m not IT expert but even I know it does not take R40 million to create a website. Once the news broke, South Africans were appalled at how so much money could be wasted instead of being used for other important matters, but it did not take long for the subject to fade from memory. R40 million is a huge sum of money and the fact that South Africans were not physically protesting in the streets about the misuse of the money was appalling. I wonder if perhaps it showed our politicians that if they misuse taxpayers’ money then we as South Africans will temporarily moan but it will simmer down with no true action having been taken. Maybe it is such complacency on our part as citizens that encourage the politicians to behave corruptly because they face little repercussions for it. The EFF standing up and actively showing their is disapproval regarding the gross misuse of taxpayers’ money and asking if the president intended on repaying that money, was vital; it showed how fed up people were with dubious behaviour from those in power. South Africans are fed up of bad service delivery, corruption, abuse of power by our politicians, and the manner in which our beautiful country is being run into the ground by politicians who continue to waste money instead of moving this country forward. We are far from seeing the end of this issue because the ramifications of what happened on the 12th of February 2015 will be dealt with for quite some time to come. Best that we prepare the popcorn, settle in, and watch as the story continues to unfold.